I was never really good at Biology. I have a faint grasp of the basic concepts but that is just about it. I know that there is some sort of classification for all living things but I can't recall enough knowledge to be able to teach my sons about it. Fortunately, with the existence of Internet and the great scientific apps on the App Store, Philip and Noah can enjoy a better learning environment. Hopefully, they will be able to learn and retain more of the knowledge with the existence of these apps. I will share one of them today - a really great app about insects, entitled Meet the Insects: Forest Edition. Using realistic graphics and photo, the app provides an immersive environment for learning about insects that dwell in the forest. Meet the Insects: Forest Edition is a unique app developed for juniors who want to explore the world of insects. The developer made the app based on the facts provided by the National Science Museum of Korea and included basic informational stories about the insects, plenty of awesome photos and videos, and a small encyclopedia on three insect subclasses, i.e. Coleoptera Order, Lepidoptera Order and Hemiptera Order. 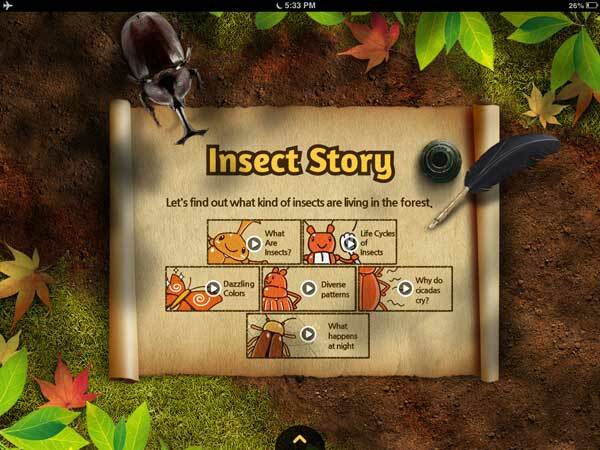 It is best to start by watching the interactive story of insects that is included within the app. This section tells the basic information on insects, i.e. how insects are different from other animal types, the insect life cycles and what typically happens in the forest at night time. You can learn about the different body parts of an insect, the two types of metamorphosis that insects have to go through from their birth to adulthood and how butterflies and beetles get their beautiful colors. These videos are designed beautifully that I am sure you want to replay them again and again to ensure that you do not miss a single fact. Once you have finished watching the introductory video, you might want to check the vast gallery of insects, arranged in the order of their subclasses. You typically start from Coleoptera Order and move your way up using the slider on the right hand side to Lepidoptera Order and Hemiptera Order. You can tap on the title to jump into the detailed information of each insect. Inside each page, you can find information that is unique to that insect, fun facts, interactive section, photos and videos. For example, you can view the body parts of a Stag Beetle in zoomed-in macro photographs, watch a video of a Parnassius butterfly feeding on a flower, or learn how an Assassin Bug can inject a lethal toxin into our body. The app provides detailed information about four different subclasses of insects along with photos, videos and interactive sections. In addition to the plethora of multimedia contents, this app also has a unique journaling feature. With this in-app journal, you can encourage your juniors to take photographs using your iPhone/iPad whenever you encounter an insect. When you return home, you can post the photo in your journal alongside other information, such as location, weather and free-form notes. I believe this is an excellent feature that encourages juniors to develop a habit of making journals and reflecting on them. If you want to know just how much you have learned about insects, you can take the interactive quiz that is included within the app. There are two forms of quiz, i.e. a set of true/false questions and a set of multiple choice questions. It is a good idea to take the quiz before you start learning and then retake it after you have completed the app. Comparing the results should give you an idea of how much you have learned. Take the quiz to measure how much you have learned through the app. When you browse the insect gallery, you will notice a sun/moon icon located at the top right corner. Tapping on this icon will toggle the entire theme of the app from day to night and vice versa. You will also notice the difference in the background music and sound effects that accompany you. I find this to be really cool. Stink bugs give off a strong foul smell from their odor pockets. When you touch them, your hands will smell really bad. The assassin bug gets its name from the speed at which it grabs and poisons its prey. A Parnassian butterfly has a very small amount of powder on its wing, making its wings look transparent. Finally, I really like the overall look and feel design of the entire app. It is really are beautiful. I also find the animation of insects when the app is idle very fun to watch. The app also encourages juniors to make journals and take photos of the insects that they find. Meet the Insects: Forest Edition is a high quality science app for juniors who want to explore the world of insects. By displaying the wide varieties of insects and their massive information in the formats chosen for this app, I find that it is easier to engage kids to learn. I highly recommend this app for juniors who are starting to learn about the animal kingdom. Gifting this app to your nephews and nieces would also be a great idea.